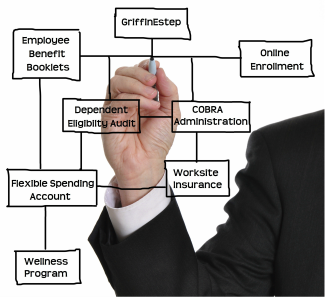 GriffinEstep ​is a leading independent full-service insurance brokerage firm based in North Carolina that specializes in Business Insurance, Personal Client Insurance and the implementation and administration of Executive and Employee Benefit Plans. ​UBA’s partner firms leverage collective knowledge, best practices, and the strength that comes from more than $16 billion in employee benefit expenditures to ensure that your employees get the very best in local management and delivery of employee benefit solutions. UBA’s combined strength and national presence affords our clients shared knowledge, preferred pricing and enhanced services that are unparalleled in the marketplace. ​GriffinEstep offers a complete portfolio of insurance products and services that allows us to better serve the most complex and in-depth insurance needs of our clients. We offer Business and Personal property and casualty insurance services through GriffinEstep Insurance Group and our affiliate Insurance People. We are committed to understanding the goals and needs of our clients and will consistently strive to provide outstanding products, innovative solutions and superior service to build long-lasting relationships. To find out more about our company please contact us.